Nolan, an 8-year old boy living in Deer Park, Wisconsin, has received a very generous $10,000 Grant towards his very own Autism Service Dog from SDWR. Deer Park, WI, April 17, 2019 --(PR.com)-- Nolan, an 8-year old boy living in Deer Park, Wisconsin, has received a very generous $10,000 Grant towards his very own Autism Service Dog from Service Dogs by Warren Retrievers, or “SDWR,” to assist him and help better communicate his needs. SDWR, a 501(c)3 non-profit organization located in Virginia, is one of the nation’s largest service dog providers with over 600 service dogs placed. SDWR is now serving over 1,000 families through its programs. SDWR breeds, trains, and places service dogs to adults and children with invisible disabilities such as Diabetes, Seizure Disorders, Post Traumatic Stress Disorder, or in the case of Nolan - Autism Spectrum Disorder. Service Dogs by Warren Retrievers, or “SDWR,” is known for its customized training methods that aid those with invisible disabilities. In recognition of April being Autism Awareness Month, SDWR sponsored a Grant Program for Autism Service Dogs. The grant program is for individuals in North America diagnosed as being on the Autism spectrum, to include Aspergers. SDWR accepted applications throughout the month of March and a great deal of their decision making process in determining who received an Autism Grant relied heavily on the essay portion of the application. Nolan was diagnosed with severe autism at the age of 3-years-old. Not only is Nolan on the autism spectrum, but he also suffers from anxiety, pica, hair pulling disorder, global developmental delay, and generalized mood disorder. Nolan is a nonverbal boy that is almost 9 and has no relationships with other children due to the fact that he goes into meltdowns over the most random things and cannot be consoled. His family is not able to take him to the park because it is not fenced in and his family also has to worry about him eating rocks, mud, and sand. Nolan wants constant physical contact during the night and is desperate for companionship and attention. His family believes a service dog would help comfort him and teach him how to touch nicely. Nolan’s family is hopeful that a service dog will act as a guardian for him and help keep him safe. SDWR has awarded several grant opportunities to help families with loved ones on the Autistic Spectrum alleviate funding efforts for their very own Autism Service Dog. SDWR has awarded four $7,500 grants, two $10,000 grants, two $12,500 grants, as well as awarding two lucky families a full $25,000 Autism Service Dog Grant. For existing clients, the SDWR grant covers up to $10,000 towards an outstanding pledge or the remaining balances, whichever is less. The selection process is based on ability to care for the service dog after placement, ability to follow SDWR’s training program, the information on the application, and participation in allowing SDWR to publish benchmark moments about the service dog and handler. SDWR has developed a unique program for training dogs to support children and individuals on the autism spectrum and their families. Not only can service dogs provide an overall calming effect for the child on the autism spectrum, but there are a number of tasks the dogs can be taught, too. These tasks include finding the child if lost, serving as stationary ballast in the case of elopement, and providing redirection from repetitive or self-injurious behaviors among other tasks. When paired with a service dog, children on the autism spectrum often have improved sleep patterns, increased social interaction, and a better ability to express themselves. SDWR provides high quality Labrador Retrievers, Golden Retrievers, and hypoallergenic breeds (exclusively for those with verifiable allergies, additional pledge will apply) that are suitable for service work. SDWR has developed a partnership with their breeders coupled with unsurpassed training, allowing them to offer their clients another tool to better manage their life of dealing with a spectrum disorder. 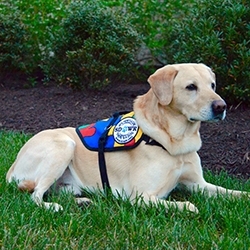 To learn more about the types of service dogs SDWR offers for those living with invisible disabilities, visit https://www.sdwr.org/service-dogs/. To make a donation, be a sponsor of a future grant, or learn more about SDWR, please visit the website, www.sdwr.org.